I had Hyson Jamaican Love, which was a green tea with stuff in it, which smelled of melon. Also from Hyson, I had their Champagne Fizz, which was a black tea with a noticeable aroma of black currant. From the Indonesia Tea Company, I had both their black tea, which was good, as well their black tea premium, which I found to be calmer than the black tea. 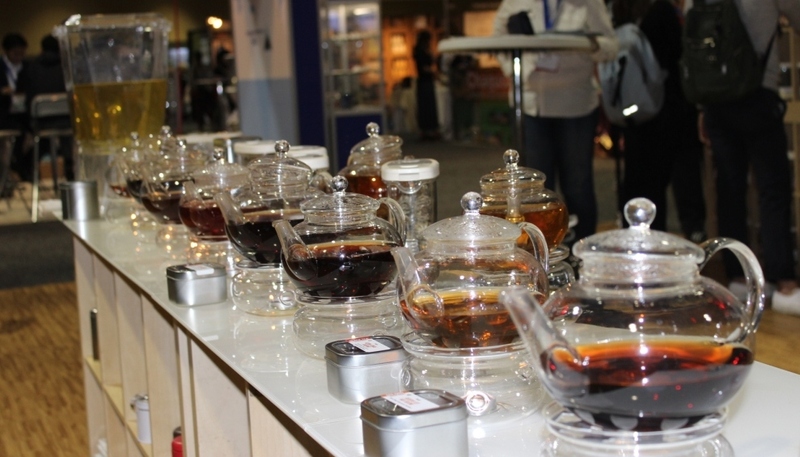 A huge, yet very orderly set-up to draw attention was International Tea Importers‘ space. With various tea products encompassing the rectangular set-up on two adjacent sides, there were eight teas set out in the middle of the space on two long adjoining tables, which made for an excellent opportunity for a tea tasting flight! I went down the line they had laid out, starting with their First Flush Darjeeling, which was good. Next up was the Organic Royal Golden Yunnan, which was noticeably calm. A stark difference from the previous two was the Rooibos Caramel Candy, which is just so sweet. Then a highlight of the tasting was Brendan’s Delight, which had so much going on, I did not know where to begin describing it, other than to note that it was exciting. Following that was Red Fruits, which was a black tea that had fruity additions to it, which was interesting (although it had a tall order, having followed Brendan’s Delight). Next up was Assam Jungle Cabernet, with licorice root being prominent. A quite different tea next was Reserve List Milk Oolong, which was buttery and calm. Finally, I had the Indian Darjeeling Tea Singbulli Second Flush, which was tasty and so easy to drink. Another mega-booth that drew attention to it was that of the Korea Ginseng Corp. With someone dressed in an eye-catching (and almost slightly creepy) ginseng root mascot costume, the Korea Ginseng Corporation was showing off their teas with ginseng root. I had most of them and they were pleasant. They even had one marketed towards children! A couple of other particularly interesting booths were Wize Monkey, which made tea from coffee leaves. This concept is so awesome, in that they help farmers and the local economy in Nicaragua in not only making use of the coffee leaves, but also providing more jobs there. I was not the only one to think that this was fascinating, since they won the Best Tea Industry Innovator Award at the World Tea Expo. Oh, and their teas? I had all three of their teas – original, Jasmine, and Earl Grey – and they were solidly good-tasting.